Last week was mostly spent showing my 15 year-old cousin around London, so there has been minimal plot time. Poor thing’s had a very damp week of it. All the rain would have meant it would be difficult to do much anyway. August is turning into a real washout. So much for my daydreams of plot progress. As a treat on the last day of my holidays I managed a few hours between the showers and got 20 of the saffron bulbs planted into large tubs. I reckon I can get half into the ground before the end of the month, and the other half will be in tubs till next year when they can be moved to their final home. I have bagged flower buds on the padron peppers as there are only 6 seeds left in the packet and that definitely won’t be enough plants for next year! Picked: bowl of large achocha for cooking with, borlotti beans, 2 Diva cucumbers, 2 patty pans and a few tomatoes. The achocha are great when they are bigger – we’ve been having them on pizza and in omelettes and are very tasty & quick to cook. Definitely one for next year, and 3 plants easily provide enough for us. Also now going to be a staple are the borlotti beans and La Diva cucumbers – the latter are out-producing the Marketmores by some way. They are also doing better than the gherkins – which had the supagro fertiliser rather than growmore. I think growmore wins. On the squash inspections I found a few more Thelma Sanders flowers getting ready to open. Two of the Black Futsus that I know were pollinated have aborted, so perhaps there were too many on one vine. There are only 2 butternuts from 3 plants, so I wonder what I did wrong there. 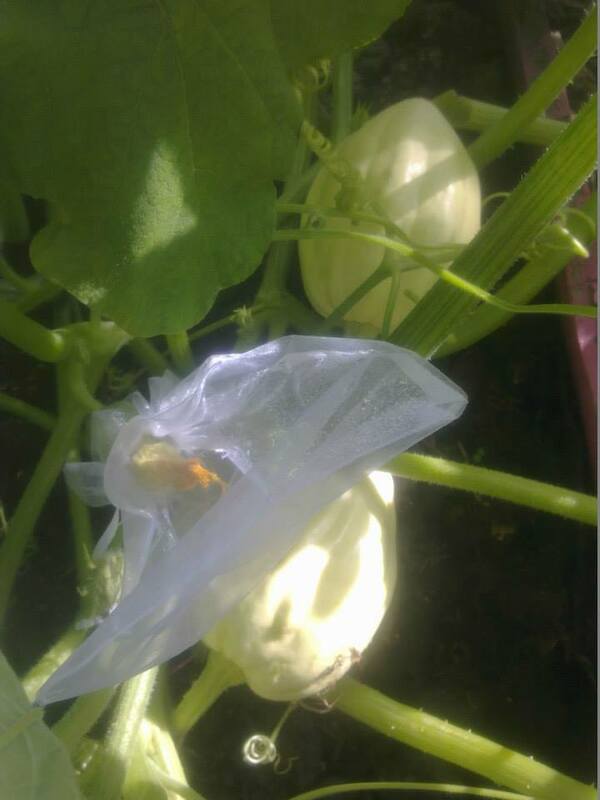 The 2 Rouge Vif d’Etamps squash are starting to turn from yellow to orange and look beautiful. Tomatillos are loaded with fruit, but don’t show any signs of being ripe. Being outside has probably slowed them down and I wonder whether I will get anything from them. Likewise the cape gooseberry. One of the alberto chilli plants has 3 chillies on it, the other 4 have nothing. Perhaps because they were started late and couldn’t catch up? Will keep the seed and try again next year. The tomatoes are a bit of a disappointment – I have grown too many large tomatoes and not enough cherry/mini-cherry ones this year. The black cherry ones from Sunny have a gorgeous flavour and I will definitely save seed for next year. T he watermelon is now small football size and sounds hollow when tapped, so I am wondering whether or not it is ready. 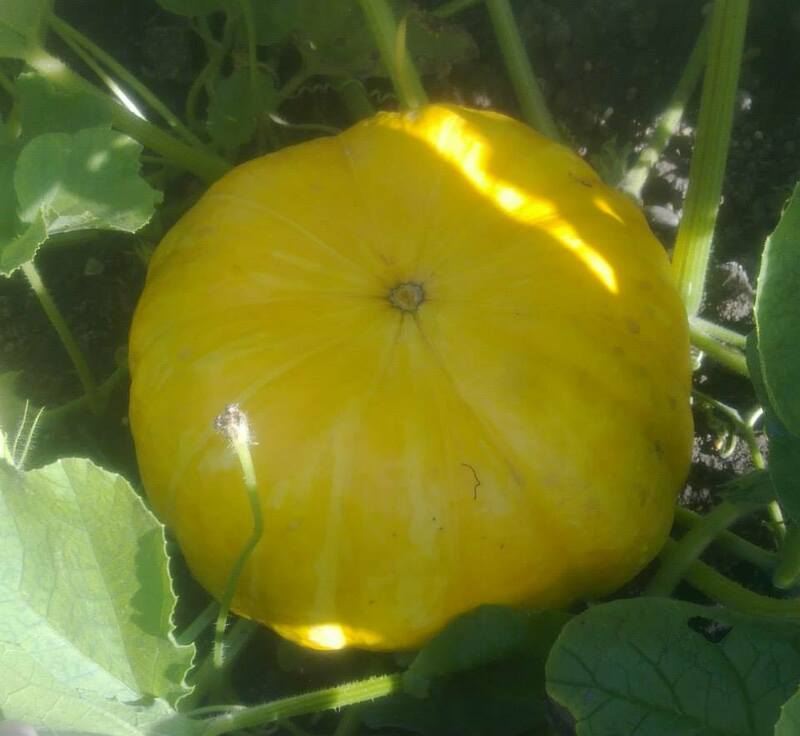 Thanks to the slugs eating all the other fruit, it is my only melon, but they were a lot of fun to grow so will be on the list again next year. Set out in a sunnier bed and earlier, under the cloche. I met one of the gardeners from the Hampton Court veg garden last week (a reluctant teenager was dragged to the new veg garden, but soon had her face in her iphone! ), which I thought was really exciting. I think/hope *crosses fingers* we might be able to link a small local seed circle for next year with them. Which would be brilliant! Edit to add – Found it!!! http://leslieland.com/ Lost the link to this lovely blog site.